Traditional jurisdiction in many countries often takes too long. Most of us experience delays of months or even years. And not to mention the hefty lawyers bills. 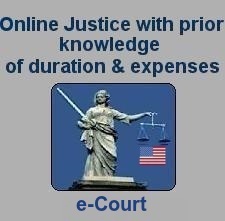 With e-Court, you know the duration and exact expenses of your case beforehand. We make justice in most jurisdictions transparent, professional, speedy, and above all inexpensive. Information about your case is always secure and accessible. Since its inception in 1973, Heenan Blaikie has become one of the leading law firms in the country. With our outstanding track record in business law, labour and employment law, litigation, tax law, entertainment law and intellectual property, we deliver comprehensive legal advice and innovative business solutions to clients across the USA, Canada, Asia and Europe. Many law firms today talk about value as if it's a new concept. At Fisher & Phillips, we were committed to providing value to our clients long before it became a fashionable topic of conversation. Our commitment to value dates back to the founding of our firm nearly 70 years ago. Covington & Burling LLP represents clients in cutting-edge technology, litigation, white collar defense, transactional, governmental affairs, international, life sciences and other matters. In responding to the needs and challenges of our clients, our lawyers draw upon the firm?s expertise and experience in a broad array of industries to provide solutions to difficult, complex, and novel problems and issues, whether in litigation, transactions, or regulatory proceedings.